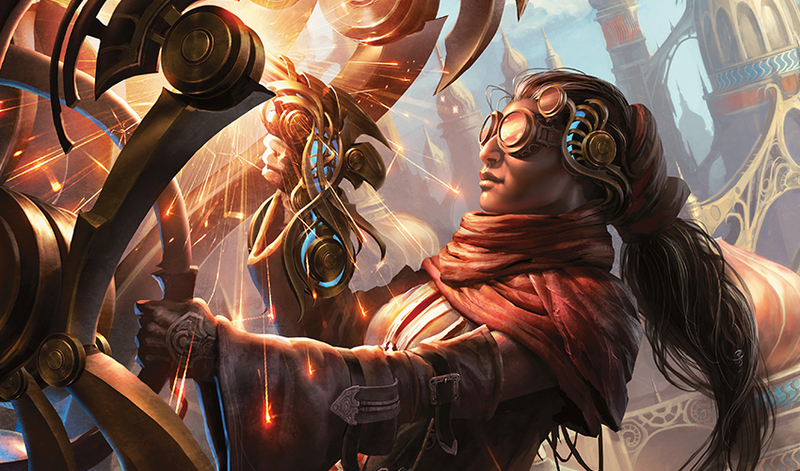 A Planeswalker from Kaladesh visited Ravnica to ask for the assistance of the Gatewatch. 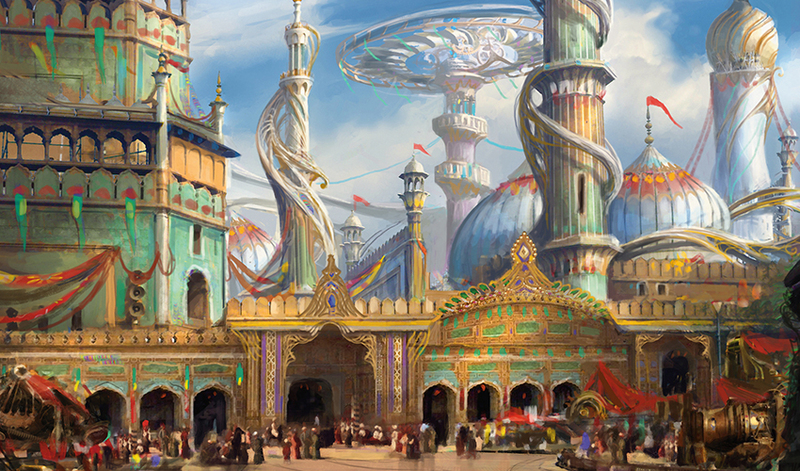 The consensus was that the Gatewatch should only intervene in the case of interplanar threats, however, and a possible threat to the Kaladesh Inventors' Fair was not deemed a matter for the Planeswalkers. 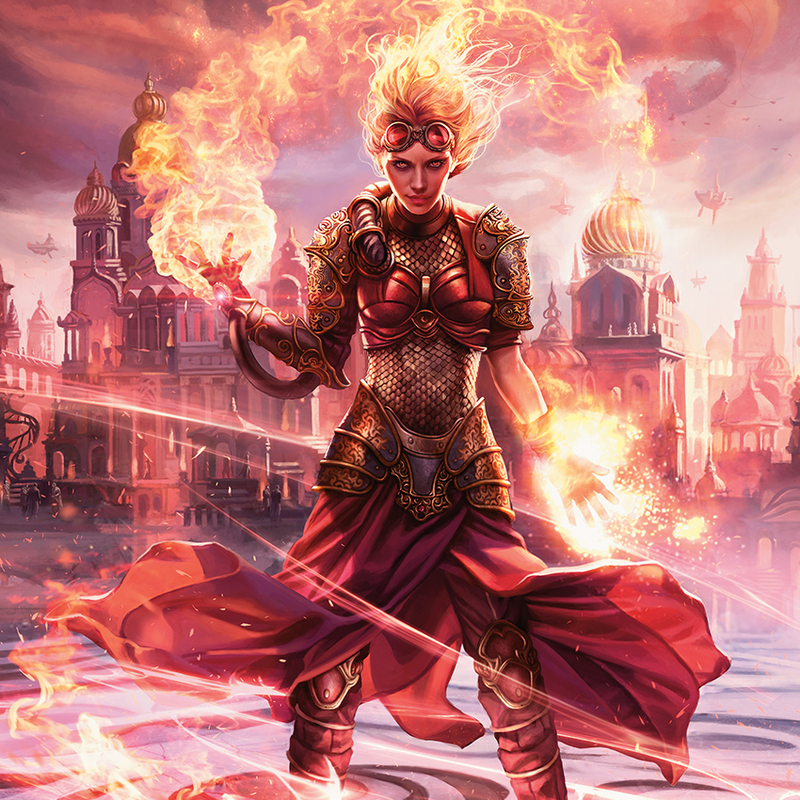 For Chandra Nalaar, though, the plane of Kaladesh is personal—it's her home plane, a world she hasn't been back to since her spark ignited and she took her first planeswalk twelve years ago. Without consulting the others, she has planeswalked back to Kaladesh, back to her home. Home was an atrophied muscle. The path back to Kaladesh was covered over with time the way a road gets reclaimed by weeds, and for a moment, Chandra wondered if she even remembered the way. Before she could take a deep, soothing breath, though, she had arrived. 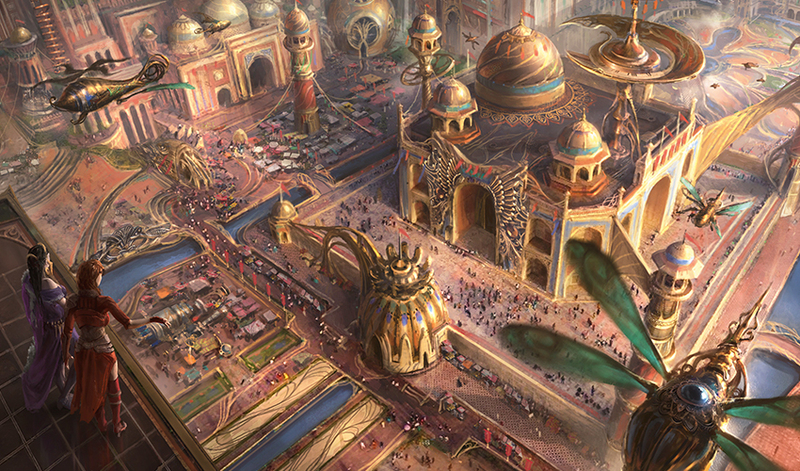 Chandra stood in the center of a plaza of warm brick, reeling in surreal familiarity. Cardamom and incense, welded copper and gear grease, the musk of passing arborbacks, the tang of bandar fur. There were the familiar traces of aether in the air, fresh and open like sun-soaked linen, but with a prickle of action in it. It was the aether smell that told her, finally, that she was home—the raw potential that curled the clouds in the sky, surged in the hearts of airships, and coursed through the city in thick glass pipes. The last day she had been on this world had hung in the past, interrupted and partial. That day had resumed, except everything looked busier and—taller. Wasn't visiting your childhood home supposed to make you feel bigger? 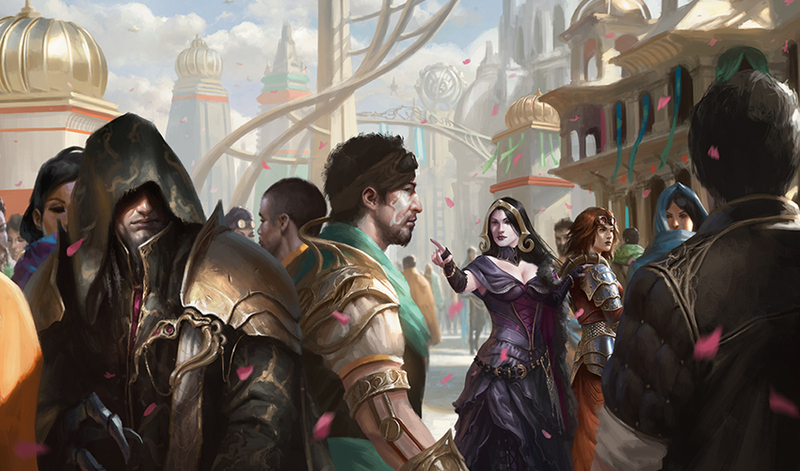 People swept past her in a customary Kaladeshi hurry. The melody of their voices jolted her. She heard morsels of conversation that could have come right from her own family home—eager predictions about some famous inventor in the Fair, gruff opinions on the merits of this or that airship design, clipped exchanges about onrushing deadlines. She growled and stamped her foot. She doused her hands on her thighs and wiped an eye. No. Somewhere in this crowd was the renegade she sought, the inventor who was in danger—and the rest of the Gatewatch didn't care. Her family had worked against the Consulate when she was growing up, dodging patrols to supply aether to brilliant inventors. She didn't know why this person was so important to her, or why this mission had been the thing to draw her back to Kaladesh. She just knew she needed to find this inventor, and soon. Ghirapur thrived all around her, a city of thousands of faces. She didn't even know what this renegade might look like. Chandra felt a splinter of that familiar feeling—the feeling of having gotten herself into something without any plan of how to get back out. She felt a tiny urge to about-face back to Ravnica. A pair of Consulate lawkeepers glanced at her, evaluated her, and moved on—and the reassuring spike of defiance chased away her urge to flee. She instinctively hid a reflexively-made fist, and grabbed a handful of a nearby banner. She put her foot up onto a decorated copper strut, yanked on a hanging Consulate flag, and hauled herself up onto the balcony of the level above. "So this is your home," said a woman next to her. Chandra started, then scowled. Standing on the formerly unoccupied balcony next to her was Liliana, leaning her crossed arms on a rail and looking out over Ghirapur. A gray-haired man slipped through Ghirapur with a series of sideways moves. He avoided main thoroughfares and stayed off the ticketed Express, zigzags drawing him in and out of parts shops, along aether arteries, and through shadowed courtyards. He snatched his hood around his cheeks, keeping his face hidden from patrols and thopters. No one stepped on his shadow as he made his way closer and closer to the Inventors' Fair. Chandra gripped the balcony rail and glared at Liliana. "If you think you're here to convince me to come home, you can just go." Liliana scoffed. "Wouldn't dream of it. You are home." "I'm not going back until I find whoever this Baan was looking for." She gritted her teeth, hitching her mother's shawl around her waist. "No matter what you or the others want." "It's what you want that matters. Damn the others, if they don't see what your home means to you." "They mean well," Chandra jabbed back. "They just...they wouldn't understand all of this." 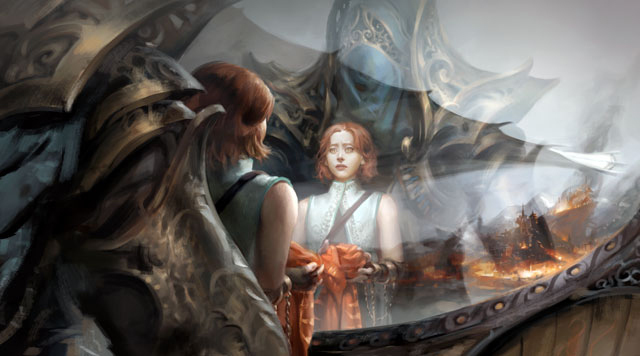 A hundred explanations of what Kaladesh did mean fought their way to the surface of her mind, but none of them were large or complicated enough. What could your childhood home mean, when it took your childhood away from you? How was home supposed to mean anything at all, when you became who you are by leaving it? "Tell me," Liliana said. "Maybe I can help." "You wouldn't understand, either," Chandra said. "I understand that home can be a source of pain," Liliana said. Her face was a series of unreadable lines. "I understand that Baan is a dull series of regulations in a pretty uniform." "Baan's one of them. The Consulate. They keep the city running, but they also hate anyone or anything who dares paint outside the lines. Outcasts. Renegades." "Fun people, in other words." "I just mean, people like me. And my parents." Chandra put her hands on the railing. A trickle of smoke rose from the wood. Liliana conjured a violet glow around her fingertips, and her lips widened into a grin. "Then I think it's high time we celebrated your grand return to your hometown." Chandra cocked an eyebrow. "I'm here to accomplish something." "We can still look for your precious renegade along the way. But look at you! You're not even enjoying the giant party going on down there. Besides. I think you and I, in this town? Could get ourselves into some deeply satisfying trouble." Chandra's own grin came unbidden. "Liliana, you're two centuries older than me. Exactly which of us is supposed to be the responsible one?" "Let me tell you a secret." 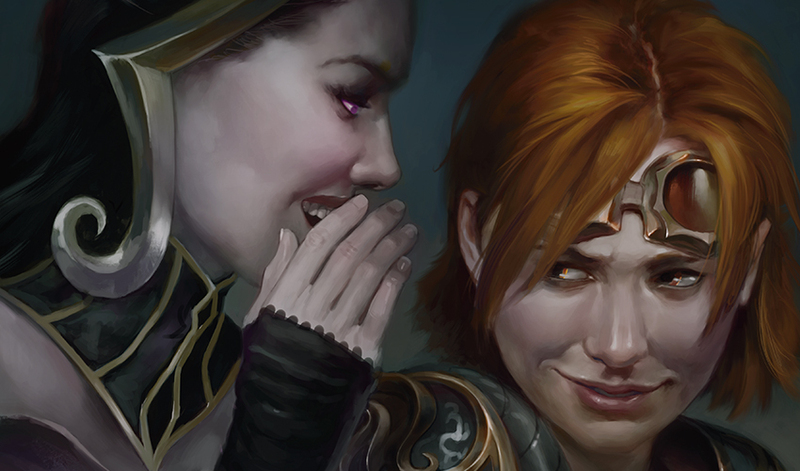 Liliana cupped a hand playfully near Chandra's ear. "There doesn't have to be a responsible one." The man in the hood wrapped himself in the hum of the Inventors' Fair, and listened. He kept his face and right arm hidden, no longer to dodge the Consulate soldiers or prying eyes of the bright-lensed thopters, but to walk freely among the fairgoers. Inventors would recognize him instantly, of course, and interrupt his work. He couldn't have that. He needed to complete his mission before anyone had a chance to notice him. He slipped into the flow of the crowd, and he listened, following their words to his target. The aether trails in the sky faded from soft eddies of azure and white, to gold and copper, to salmon and violet, and finally to luminous turquoise against sparkling black. Chains of aether-powered lights twinkled to life, and light and music spilled from every doorway in the city. Chandra's and Liliana's search for the renegade had become a series of chats with renegade sympathizers, which had become hours of mingling with inventors in society halls and ballrooms, which had become, somehow, dancing. Chandra found herself in reels with spins and acrobatic leaps, ceremonial dances to hail the achievements of great artificers and pilots, some expressive wriggling that borrowed from her time as a Regathan monk. Chandra's cheeks glowed. She glanced back at Liliana, who, having spent all of a day on this world, looked irritatingly, perfectly at home. Liliana leaned by a wall of the club with a drink in her hand, quietly launching a full charisma assault on a vedalken in Consulate uniform, looking something like a lion toying with a wounded antelope. When the vedalken soldier's blue face suddenly flushed to purple, and his smile reversed, Chandra's fight-or-flight reflex kicked in. She hurried over to hear the Consulate man go into accusatory mode. The vedalken's eyes were thin slits now. "And even if I did know about threats to the Fair," he said, "what business would it be of yours, madam? If you've witnessed something, it's your duty to report it." Liliana's swagger-turn toward him was elaborate. "Well I think it's your duty to—" And then she dropped a vulgarity so shocking that it would have been the equivalent of tossing her drink into the vedalken's face—which she then also did. Liquid dripped from the man's taken-aback face and dribbled down the straight lines of his Consulate uniform. Chandra's mouth made an O. She was unsure whether to gasp in horror or burst out laughing. "Serves him right, eh, Chandra?" Liliana winked at her. "This is my colleague Chandra. A proud renegade sympathizer." Alarms went off in Chandra's head. "Renegades," said the vedalken soldier, the way one would pronounce the name of a species of vermin upon finding them residing under the floorboards. He mopped his face with a scarf, and reached into his pocket for something. "You two," he said. "You're going to come with me." When Chandra saw what the Consulate vedalken had produced from his uniform—a simple pair of restraints, jewel-like in their filigreed artistry–the rage appeared. Her hair became fire. Her fingers became a fist. She was eleven years old again and riding a rising wave of fury. The soldier made a startled face at Chandra's hair display, and that might have been motivation enough. But it was when he sneered, "Hold out your wrists," that Chandra's fist arced around and collided with his jawbone in one fluid motion. The man's face swung around to face the wall of the nightclub, a tooth ricocheted off the wall, and he slumped to the floor in a heap. Liliana laughed as a kind of applause, like someone watching dominoes topple in sequence. She raised her glass. Chandra felt the faces of everyone in the club turning to her. "Let's get out of here," she said. "But don't you want to show this crowd what else you're capable of? Give this goon what's coming to him?" Chandra hopped a guardrail and ducked through the back of the nightclub. She pushed through the back door, with Liliana following her into the alley. They dodged past two inventors who rumbled their automatons at each other—one device fanned its intricate copper feathers while the other spun on a gyroscopic wheel. It was dark by the time the man in the hood found the marks he was looking for. A line of young people hurried out of the shadowed stands at Ovalchase, the copper legs and grippers of their not-particularly-legal automatons sticking out from the packs on their backs. Renegade inventors. He intercepted them, taking care to look carefully casual. He kept the long coils of his silver hair hidden under the hood, but he offered his hand—not that one, the other one—in such a way as to show off a Leaking Spire symbol hidden on the inside of his glove. A dwarf woman noted the Leaking Spire and shook, meeting the symbol with her own. "I'm afraid we're drained tonight, friend." "Not looking for aether," he said. He used a subtle spell to scan the contents of her pack. Her automaton had a listener module inside it. Perfect. Now he just needed to keep her talking. "I'm looking for an associate. Hoping you might know where her little demonstration is planned for tomorrow." "Lot of demonstrations going on. You got a name?" She was trying to make eye contact, to see his face. Appropriately cautious. His information was partial, but that fit the narrative that he was a cautious renegade anyway. "She said not to use names. I'm just supposed to meet her. You haven't heard about this?" Meanwhile his next spell did its work. The little metallic listener module obeyed his commands, prying itself out of her device. It floated silently out of her pack and into his jacket pocket. "Sorry," she said with a shrug. "Don't know who or what you're talking about." But he knew she was an associate of his target. He smiled expansively in apology. "Very sorry. I'll stop troubling you." "No harm done," the dwarf said. "How can we contact you if we hear something about your friend? What do you go by—?" He turned and waved. "Have a good evening." He gathered his hood around him again and walked on. He glanced down at his hand—that hand—in which he held the small, ornate copper module. As he walked, he willed it to activate, and as its gears rotated, it told him everything it had heard—conversations, times, dates. And a location. Every time Chandra and Liliana saw a patrol they turned a corner, and each turn brought them on a twisting tour of the city. They ducked through a market tent and sprinted up a set of elegant stairs. They looked down out of a window, and below them was a quiet alleyway, out of the way of guard routes. "Down there," Chandra said. Liliana's disapproval was evident, but they skidded down a set of ladders into the alley. They caught their breath, leaning on opposite walls. Shafts of daylight scraped the tops of the buildings. The crowds had begun to reappear for the day. "I'm about done with this 'breathless racing through the city' thing." Liliana dabbed her brow ruefully. "I am more of a 'dramatic strut' person." But Chandra was just looking at the mosaic on the wall beside her. The mosaic was chipped and worn. 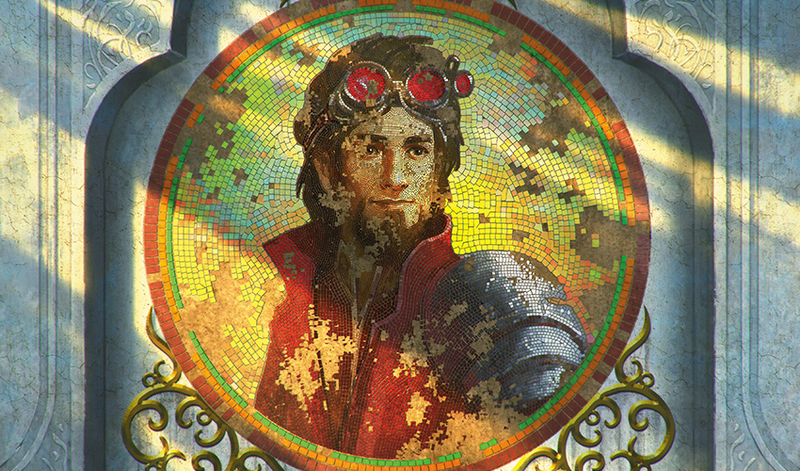 The inventor depicted in the round frame looked off to one side, his goggles on his forehead. He looked as kindly as ever. Gently amused, the way he would look at her. Chandra found a chip of color in the dust of the road, picked it up, and tried to press it back into place, but it wouldn't stick. Liliana stood at Chandra's side, looking at the mosaic. "This was my father," Chandra said. "Kiran." "You've got his nose. And his goggles." "He and my mother were both great inventors. They were killed when I was a child." "I'm sorry. By whom? The Consulate?" Chandra squeezed her eyes shut for a moment. "By a psychopath in a uniform. Baral. My parents died because of him. Because he hated me. Because they tried to protect me." Liliana was looking at her with curious interest. Chandra wished she wouldn't. "That's not your fault. It's his." "I shouldn't have come back here. Why did I come back here?" "Because you feel you owe them. We all have to face the choices we made when we were younger." Liliana looked at the mosaic and wiped a streak of dust from the portrait. "Perhaps we should look up this Baral of yours." "This place...this is where I learned to expect tragedy. Where I learned to be suspicious of people." "It's also where you learned to stand out. Where you learned to be dangerous." "Most people are content to take life as it comes. The world tells them they're weak, and they agree. They eat disappointment, let it rot inside of them, and then they lie down and die. The rest of us? We learn how to refuse. How to spit and throw things. We learn how to survive. You're a survivor, Chandra." Chandra looked into the eyes of her father. She grasped the hem of the shawl, her mother's shawl, that she wore around her waist. Liliana smirked. "If Baral hated your family that much, we should find out if he's still around, just to be safe. And besides, if we ran into him, you could look him in the eye, instead of that portrait, and tell him what you think of him. You deserve that." "I don't know," Chandra said. "Baral probably thinks I died that day." "Then just imagine the look on his face when he realizes you didn't. When he realizes you survived." Chandra cheered at little, thinking of that. Liliana looked her in the eyes then, and her face was serious. "When you burn him to cinders." Chandra jerked her head back in shock, but at the same time, a dark thrill dared to roll through her chest. Baral had killed her father in front of her. And she knew that Baral commanded the soldiers who lit the fires that destroyed their village, that must have killed her mother. Her entire family lost, because of one man. How satisfying it would be to see him burn. "If he's still alive," Chandra said, "I swear he's going to pay for what he did." Liliana's voice was a low whisper. "It's only right to pay back the pain he caused you." "It's only right," Chandra murmured, and her hair caught fire. "That's them!" two uniformed men shouted from one end of the alley, and rushed toward the two Planeswalkers. Spotted. Chandra made to sprint in the other direction, but Liliana grabbed her. "We don't have to run," the necromancer said, looking evenly at the guards. "There's another way to end this chase." "No. We don't do that." "We do what it takes," Liliana said, her words underscored by the blast of a train's whistle a couple streets over. Chandra shook off Liliana's hand. She looked at the two men, and cast a swirling blast of flame. But instead of slamming into the Consulate guards, the spell splashed onto the brick floor, spreading into a wall of fire that spanned the alley's width. The guards stopped short. She looked at Liliana. "Don't tell me what to do," she said. "Come on. Got an idea." They emerged on a main thoroughfare. The Aradara dawn train was enormous, yet sat balanced elegantly in a single groove in the bricks, sunlight shining off its polished wood flanks. Riders hurried into doors all along its winding length. Chandra ran and stepped up, putting her hand in the way as the doors tried to close. She and Liliana boarded as the train hissed to a start. Through the windows, they could see the Consulate guards giving up the chase and receding in the distance. A complicated mechanism at the entrance clattered at them for tickets. Chandra slammed her fist into the mechanism, cratering it. It stopped clattering. They sat. Chandra leaned her head against glass, watching the buildings of her childhood rattle past. Neither Planeswalker spoke. The train lurched and brakes squealed. Chandra grabbed her seat and stood up, only to get slammed into the seats in front of her. The train's whistle blared repeatedly, and the wheels locked underneath them, and red warning lights flashed along the ceiling of the car. Chandra looked through the windows as the train heaved. Outside—a display of constrained chaos. A squad of special Consulate inspectors waved crowds into designated zones. In the distance, burst aether pipes billowed scintillating gases into the air, and airship crews dropped dragnets to round up stray thopters. Whole buildings had gone dark, cut off from their aether supply. Fairgoers chattered and pointed skyward excitedly, but whatever had happened had seemingly already come and gone. A disruption. The aftermath of some kind of aerial display. It had to be the work of the renegade—the one Dovin Baan was worried about. An announcement squawked over the train's pipes. "This train is making an unscheduled stop. Please remain in your seats—"
"Let's go," Chandra said to Liliana over her shoulder, and dashed past several seated passengers to an exit door. "—until instructed by an Aradara conductor or Consulate official. Thank you." Chandra hot-punched the door handle. The handle mechanism vanished in a muted burst of fire, leaving a glowing-hot melted hole. She gave a kick and the door buckled open. The street still whooshed by. "This could be the renegade," Chandra said. "Has to be." Liliana nodded, and they leaped. Their feet hit the pavement before the train had completely halted. All around, Consulate guards were trying to herd people away from the direction of the disruption. Chandra plunged into the crowd, nudging through a steady tide of bodies that were trying to move away from the emergency as they were trying to get close to it. "Chandra," Liliana said. Something had caught her eye. Chandra followed her eyeline. A figure crisscrossed through the crowd expertly, keeping his face carefully hidden by a dark hood. He hadn't noticed them. He cut a path around the restricted area, keeping the source of the disruption in sight. "Conspicuously inconspicuous, don't you think?" Chandra nodded firmly. Their renegade. They had to warn him. "Hey!" she called out. "Hey you!" Either he didn't hear, or "Hey you!" was exactly what the Fair-disrupting renegade inventor didn't want to have yelled at him across a crowd full of officials. In either case, he dashed away from them, through a bank of onlookers and around a Consulate checkpoint. Chandra and Liliana gave chase, catching up to him only once he stopped to accost an older woman. The man's hood was down now, revealing a headful of gray locks. His right hand, emerging from his sleeve, was a metallic claw, which he pointed at the woman. They had caught up to the man, emerging out of the crowd behind him. But it was the woman who commanded Chandra's attention. She had auburn hair like Chandra's, but darker, and now with wisps of gray. She wore welding goggles and carried a handheld welder, and glared at the claw-handed man. Chandra's heart stopped and hot tears sprang to her eyes. She couldn't figure out how to say anything. "I've found you at last, Renegade Prime," the man said, aiming his metal hand at her as if he were pointing a weapon. "Do you think your little spectacle is going to matter to my Fair?" The woman sneered at him. "We'll stop you, Head Judge. If not today, one day soon."